Taught a fully online course for the Driehaus College of Business or Kellstadt Graduate School of Business in the 2016-2017 academic year. I hope you are enjoying Spring Break, and are relaxed and rejuvenated for classes next week. There have been some significant improvements to D2L recently, such as the “Daylight” interface that provides a mobile-friendly design that allows students and faculty to have a pleasant experience no matter what device they use (our students have been very happy about this). What’s New in D2L: 2018 UpdateHaven’t looked under the hood in a while? Come to this Tech Tuesday for a look at some new features you might have missed. D2L has a new look and feel, Daylight, and with it come some new options to enhance your course, stay on top of your class progress and create a better experience for all. I hope you can attend. Registration opens March 27th for the 34th Annual Distance Teaching & Learning Conference! 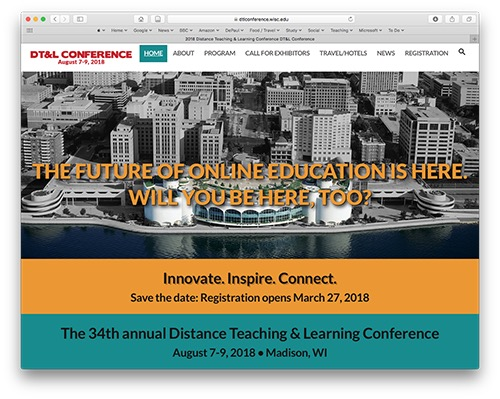 Join 800 distance education professionals for three days of innovation, inspiration, and connection. Gain new skills, fresh knowledge, and the motivation to apply what you've learned.